Sunderland only worsened their home form last time out at the Stadium of Light as they lost 2-1 to West Ham. Sunderland have scored just 14 goals in 15 league games at home this season, only Crystal Palace (also 14) have failed to score more. This lack of fire-power has reflected in their results at home having picked up just 12 points from a possible 45, the fewest in the division and only West Brom (3) have failed to win more games at home than Sunderland's tally of 3 wins. Those wins came against Stoke, Newcastle and perhaps bizarrely, Manchester City. Regardless of whether Sunderland win, lose or draw against Tottenham in their match tonight, they'll go into this game with the best record over top teams this season amongst the bottom 11 teams. 2 of their 4 wins came at home at home to Newcastle and Manchester City whilst the other 2 were a 3-0 win at Newcastle and a 1-0 win at none other than Everton. 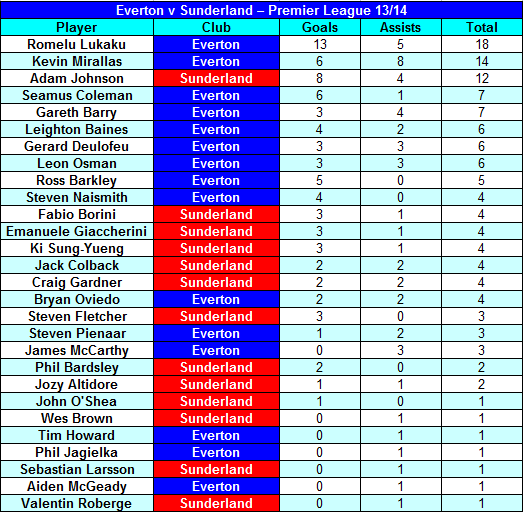 Sunderland haven't done the double over Everton since the 1996-97 season. Everton's exquisite display against Arsenal was their 6th win in a row in the league, equalling a run from November 2002. A win against Sunderland would make it a Premier League record of 7 wins in a row for Everton and equal Everton's best away sequence of 3 wins in a row, last achieved in December 2008. Everton have now scored 3 goals in each of their last 4 matches. Everton haven't picked up a draw in 10 league games, nor have they picked up a draw in their last 5 away games. Everton are the only club from the top 9 teams yet to lose an away game to the bottom 11. However, they've only managed 4 wins in 9 games, against West Ham, Fulham, Swansea and Aston Villa. Everton have failed only failed to score in 2 of those 9 matches after 0-0 stalemates against Cardiff City and Crystal Palace. Sunderland: Sunderland's only doubts for the game are Steven Fletcher and reserve goalkeeper Keiran Westwood. Need to keep up the high scoring momentum. This is no game for a shady one nil win. Me too...kids crying in the stand and that. It'll be a tight affair though as it always is for us at Sunderland...I fear a draw I'm afraid. Has Barry's potential yellow card ban cleared btw? Now i am become death, the destroyer of worlds..
Eddie:Just like the Russian police.... Stern. Stern but fair. Do we want Sunderland to win their match? ........yes I think so ,just to get Spurs out of the picture. 1-1 now.